NOVATO, CA – BetterGIS, an innovator in Geographic Information Systems (GIS) applications, today announced that James Rodisch, an executive leader with decades of experience building growth companies, has been named Chief Financial Officer and a member of the company’s executive management team. Rodisch has more than 40 years of business and academic experience. He has a long track record of success working with dynamic companies in technology, software, healthcare and education. He has served as CFO and Chief Operating Officer, as well as Director of finance or business development. He has worked with start-ups, early-stage firms and nonprofit organizations. During his career, Rodisch has helped raise or access more than $40 million in venture capital. At BetterGIS, Rodisch will oversee the company’s finance and overall operations. He will work closely with CEO Michael London on capital raising and serve as a key member of the executive management team. Most recently, Rodisch was Vice President of Finance and Administration at the Center of Sustainable Energy. In that role, he was responsible for accounting, human resources, information technology and office operations at four locations with revenue over $175 million. Prior to that, Rodisch was Assistant Dean, Academic Affairs, at DeVry University where he increased campus enrollment growth 600% between 2009 and 2016. Earlier in his career, he was President/COO for Abington Health Alliance Inc., a $5 million funded joint venture of the hospital and medical staff. The ventures included Abington Group Health, Abington IPA, Alliance Healthcare Co., Alliance Pharmacy Co., and several others. His past experience also included executive positions at University of Phoenix, CompassLearning and Rady’s Children Hospital in San Diego. BetterGIS was founded in 2015 by a team engineers and utility infrastructure professionals to address their No. 1 problem: Managing out-of-sight, out-of-mind utility and facilities infrastructure that often leads to costly overruns and delays. 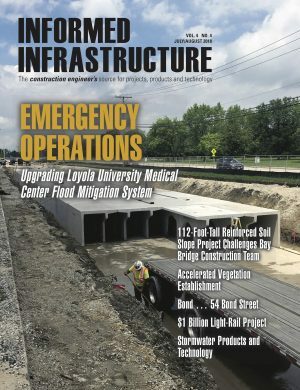 BetterGIS is focused on the $1 trillion management challenge faced operated by municipalities, colleges and schools, water and sewer districts, hospitals and medical centers, and commercial real estate companies. UVARA, the firm’s easy-to-use Geographic Information System (GIS) platform revolutionizes the planning, design, building and operation of utility and facilities infrastructure by providing digital mapping of underground, surface and overhead assets with decision-support tools. For more information, visit www.BetterGIS.com.